In honour of Dr. Hartley T. Richardson [BComm(Hons)/77, LLD/04], President & CEO of James Richardson and Sons, Limited, and his innovative leadership in business and commitment to the community, a new initiative is underway to create the Hartley T. Richardson Student Support Fund. The goal is to raise $2 million to create two bursaries that will increase opportunities for Asper School of Business students. The Hartley T. Richardson Student Support Fund will enable students with limited financial means to obtain a world-class business education by providing renewable bursaries to help cover the costs of tuition, books and fees. The renewable nature of the bursaries will provide students with the freedom to focus on their studies and will support their educational path through to graduation. Exchange programs create opportunities for students to broaden their perspectives and can help prepare them to lead in a global economy. The Fund will also help make these life-changing opportunities possible for all students. Make your gift by April 29 and receive special recognition at the IDEA Dinner. Next May, our friend Dr. Hartley T. Richardson will receive the 2019 International Distinguished Entrepreneur Award. This is a fitting tribute to an inspirational leader who has achieved remarkable entrepreneurial success. Hartley is equally known for his leadership in business, his community leadership and his commitment to philanthropy. He has been a champion of youth and education, consistently working to reduce barriers and create opportunities so that the next generation of innovators can achieve their potential. In honour of Hartley and the transformative impact he has had as a business and community leader, we’re creating the Hartley T. Richardson Student Support Fund. By establishing this fund, we aim to celebrate Hartley for his committed support of future leaders of our province and country. Our goal is to raise $2 million - $1 million for each of two new bursaries - and announce our success when Hartley receives his award at the IDEA dinner on May 23, 2019. We know that you have also been inspired by Hartley and hope you will join us in honouring him by making a contribution to his fund. Together, we can celebrate Hartley’s exceptional contributions by providing students with opportunities to unlock their potential, discover new paths and build a strong foundation for their future. There truly is no better gift. 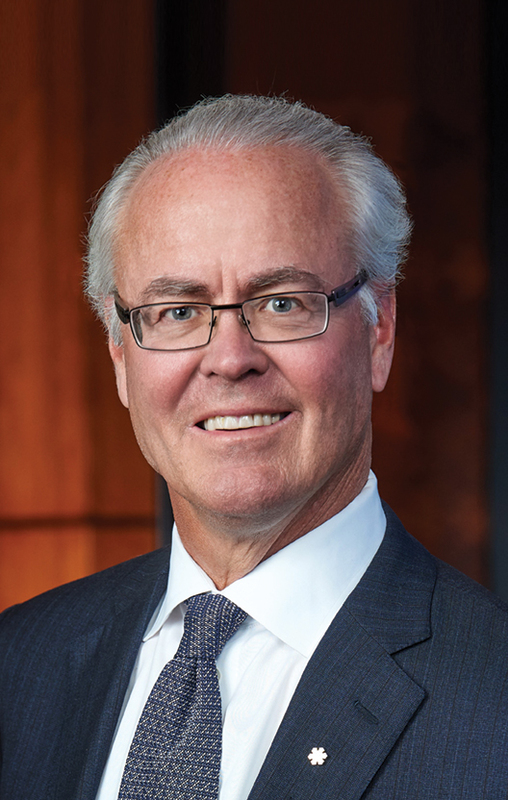 Hartley T. Richardson [BComm(Hons)/1977, LLD/2004] is the seventh family President of James Richardson & Sons, Limited, one of Canada’s largest private, family-owned corporations. Dr. Richardson attended the University of Manitoba and received his Bachelor of Commerce (Hons.) in 1977. He is a member of University of Manitoba’s President’s Campaign Team, which is leading the university’s Front and Centre campaign. Dr. Richardson received an honorary Doctor of Laws from both the University of Manitoba in 2004 and the University of Winnipeg in 2012. He was appointed to the Order of Manitoba in 2008, and appointed a Member of the Order of Canada in 2007, promoted to an Officer within the Order of Canada in 2013. He currently serves as Chair of the Assiniboine Park Conservancy, Chair of Talent Fund’s Advisory Committee and Co-Chair of the TransCanada Trail Foundation. Dr. Richardson is Past-Chairman of both the Business Council of Canada and Business Council of Manitoba. Since 1984, IDEA has recognized the outstanding entrepreneurial success of a business executive who has made an exemplary contribution to economic life. A flagship event of the Associates, Manitoba’s premier network of leaders, IDEA supports the Asper School of Business and generates international awareness to the University of Manitoba. Dr. Richardson is the third Manitoba recipient of the award and joins the prestigious list of past recipients including: Dr. Israel Asper, Dr. Albert Cohen, David Thomson and Arianna Huffington. Contributions to the Hartley T. Richardson Student Support Fund can also be made by contacting: Stephanie Levene, Associate Vice-President (Alumni & Donor Relations) at 204-474-8455 or Stephanie.Levene@umanitoba.ca.